Join Ilia, a certified mountain guide, and his team in this 7-day catskiing trip among the best spots of Bakhmaro in Georgia. An isolated area that promises to be a year-round tourism destination. Bakhmaro, at 1.900 meters high, is a Georgian ski resort very visited in summer time, specially by local families which have their own cabins and guesthouses. Although during the winter the area is completely inhabited, the snow conditions are so good than in 2007 many consulting companies suggested to build a ski resort, auguring a success. That’s why there is a plan to build a lift system in the future and turn Bakhmaro into the highest ski resort of Georgia. Indeed, the Prime Minister Giorgi Kvirikashvili in 2016 announced that Bakhmaro would soon start to be available not only in winter but during all the year. Before the first worldwide tourists arrive Bakhmaro I want to offer this 7-day catskiing tour. Please note that this trip is available in December and March only. Last year, my team and I did a Scouting Tour up to Bakhmaro on a tractor accompanied by local guides. But now, it’s time to snowcatting! The rides on snowcat are also done with guides that know the area very well. We will decide which points are the best ones depending on weather conditions and snowfalls. To be honest, this will be the first time that a snowcat works in Bakhmaro. And that makes it a great adventure because we must find the best routes and slopes on the progress. It will be a really pioneer experience in the area and, what’s more, in winter season. When my team and I first explored the place, we found two wooden cottages to rent for future trips. As those houses were only used in summer, they have the basic facilities. Besides, the houses are located in a lonely place of the Caucasus. So, I cannot ensure the supply of fresh goods. Despite of all that I can offer in both houses, six rooms with two beds per room. The service includes a buffet breakfast, snacks for lunchtime and delicious local meals for dinner. The itinerary must be flexible due to weather conditions or any other potential danger. Besides, more days for optional skiing or sightseeing can be added. Here below you will find the day-by-day program. When you arrive at Kutaisi airport I will pick you up. Depending on your arrival time, we may spend the night in a hotel halfway to Bakhmaro. Book your place as soon as you can. Just send me a request when you are decided. I can guarantee it will be a unique experience. If I’m not available to guide you, one of my 3 teammates, all of them GMGA mountain guides, will be happy to do so. Guiding fee, Accommodation, All meals during trip and the transfer from Kutaisi airport. We will continue driving in the morning to Chokhakoura. Then, we’ll switch into the snowcat. By the afternoon we’ll enjoy some catskiing in Bakhmaro surroundings. During this period you will catski around the best spots of Bakhmaro, reaching up to 2.755 meters high. They will be 4 unforgettable days of guided freeride skiing among the snowed slopes of this Caucasus region. Time to go back to Chokhakoura. From there, a transfer will take you to the Kutaisi airport or to a hotel nearby where to spend the nigh in case of bad weather. Single room supplement 280 € per week (subject to availability). Freeride skis & poles 200,-€ per week (subject to availability). Safety package (pips, probe, shovel, bag) 130,-€ per week (subject to availability). - This trip is organized by an agency for which I'm guiding. In case I would not be available when you want to catski there, you'll be guided by another guide working with that agency. I'm from Tbilisi in Georgia. I'm a fully certified IFMGA / UIAGM mountain guide. I have the GMGA (Georgian Mountain Guides Association) certificate. 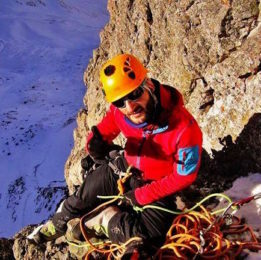 I'm a professional mountaineer, national team member of Georgian Mountain Federation. I am actively climbing in the Caucasus mountain range. - Mountaineering = Mt. Kazbek, Mt. Tetnuldi, Mt. Ushba, Chaukhi region. - Ski Touring = Gudauri, Svaneti, Kazbegi regions. I also manage large expeditions and base camps for Caucasus Mountains. Please get in touch with me if you plan to come in Georgia. It will be my great pleasure to help you and to guide you in our awesome mountains. exceptionally well preserved. Villages are just out of time and still protected from mass tourism. they should definitly be visited soon… We enjoyed extraordinary views and gigantic landscapes, followed by endless descents in superb snow… Ilia’s reputation clearly precedes him among all the guides who consider him as a reference. One recommendation : Get there soon and enjoy this beautiful region! were blessed by his kindness. He is a very patient, experienced and passionate person. Svaneti is a really beautiful region, wild and remote. I would advice staying more than a week as it takes quite some time to reach the mestia valley. The villages are vey harming and accommodation is quite good. There are thousands of ski tour possibilities and we were most of the time alone. Georgian people are great..and the food is fantastic ! I would definitively recommend the trip and our guide Ilia. powder and remote villages charged with history. Illia was a great guide both in and out of the slopes; safe, fun and knowledgeable. And do not worry about the food, it is amazing! of the best snow ever! ), and a very friendly, professional and experienced ski guide. You will always feel safe with Ilia. What more does one need? I highly recommend a trip to the beautiful Svaneti region. mountaineering life aspect. (2) Guides were all great and we had a great time + learned quite a bit in a very short time. (3) We got as far as each of us could this time. One of us reached the summit – others had to stop at different stages – but that is all part of the adventure. Overall very happy and definitely see a value in a service like Explore-Share. Very great and save Skitouringdays in due consideration to snow- and weather conditions. Many thanks to your guide Giorgi! !